Vietnam’s close relationship with the Soviet Union and the Russian Federation, its main successor state, date back to the early decades of the Cold War. The relationship was strengthened during the 1960s and 1970s, culminating in the 1978 Bilateral Treaty of Friendship and Cooperation. The bilateral relationship suffered a lull after the Soviet collapse in the 1990s as Russia enacted a wholesale transformation of its economic system and a major foreign policy reorientation. But relations regained momentum in the post-Cold War era with the establishment of the Vietnam-Russia Strategic Partnership in 2001. The partnership was then upgraded to the comprehensive strategic level in 2012 to reflect the increasing depth and breadth of the relationship. The upgraded partnership now includes institutionalised mechanisms for promoting bilateral cooperation in all fields, most notably through the frequent exchanges of high-ranking officials. Also prominent are annual meetings of the Vietnam-Russia Inter-governmental Committee on Economic, Commercial, Scientific and Technological Cooperation, annual political consultations and strategic dialogues, and regular policy coordination in international organisations and forums. The most significant aspect of the maturing bilateral relationship has been defence cooperation. Russia is currently Vietnam’s largest weapons supplier, accounting formore than 80 per cent of its arms imports between 1990 and 2010. Just five days before President Putin’s visit, Russia dispatched to Vietnam the first of six Kilo-class submarines as part of a procurement contract worth US$2 billion signed in 2009. Other recent notable Russian arms transfers to Vietnam include 20 Su-30MK jetfighters (with 12 more to be delivered between 2014-2015), two Gepard-3 frigates (with two more to be delivered between 2014-2016), and two K-300P Bastion-P coastal defence missile systems. During President Putin’s visit, the two countries also concluded a military cooperation pact to formalise bilateral defence cooperation. In addition to expanding defence ties, the two countries are also promoting cooperation in other important fields, such as oil and gas exploitation and nuclear energy. Russia is providing loans and technological assistance to help Vietnam to build its first nuclear power plant. 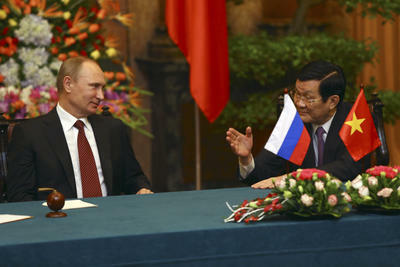 A number of factors have contributed to the strengthening relationship between Vietnam and Russia. First, the long-standing and solid foundation of the relationship since the Cold War years has resulted in a high level of trust between the two countries. While Vietnam considers Russia as one of its most important foreign partners, Russia, given its own ‘pivot’ to Asia, views its relationship with Vietnam as key to extending its foothold in Southeast Asia. The traditional bilateral military ties have also encouraged Vietnam to choose Russia as its key defence equipment supplier. Meanwhile, joint ventures for oil and gas exploitation that started in the 1970s have continued to realise fruitful cooperation. Second, a large percentage of Vietnam’s high-ranking policymakers were trained in the Soviet Union in the 1980s. As such these policymakers generally have a positive perception of Russia which underpins their inclination to cooperate with Russia as a key foreign partner. Finally, unlike other major powers — such as China which has longstanding disputes with Vietnam over the South China Sea and the US which frequently criticises Vietnam’s human rights record — Russia presents no major foreign policy sensitivities to Vietnam’s ruling elite. On the contrary, the increasingly authoritarian nature of the Russian political system under administrations led by Putin and Dmitry Medvedev is conducive to the promotion of the bilateral relationship and the growing political affinity has tended to engender common ground between the two governments. Against this backdrop, it is likely that Vietnam–Russia relations will continue to grow in the coming years. Although political and defence cooperation is likely to remain as the central emphasis of the relationship, economic cooperation holds great potential. Historically, economic ties have generally been insignificant and a disappointment to both sides. In 2012, the volume of two way trade was a mere US$3.6 billion, and Russia’s registered FDI stock in Vietnam had reached only US$1.06 billion. Looking forward, progress on economic cooperation is highly likely. The two governments have committed to increasing bilateral trade to US$7 billion by 2015 and US$10 billion by 2020. To this end, negotiations have been launched for an FTA between Vietnam and the Customs Union of Belarus, Kazakhstan and Russia. If successful, the FTA is likely to contribute significantly to the achievement of these goals as well as the promotion of bilateral investment ties. The comprehensive strategic partnership between Vietnam and Russia will continue to grow, as demonstrated by President Putin’s third visit to Hanoi this week. The real test for the future of the bilateral relationship, however, is if economic cooperation can be strengthened to the level of defence cooperation. It remains to be seen whether both countries are up for the challenge.